A couple of weekends ago I made a journey with my mother to the closest theater for the final installment of The Twilight Saga. It felt wrong not writing about it at all, so better late than never. What can I say about Twilight? It's not quality literature; there's much in it that gives a bad name to teenage female heroines; and the ending was terribly disappointing. But (and there is most definitely a but), Stephanie Meyer, like J.K. Rowling, changed YA literature forever. Teens (both boys and girls) came in droves to libraries and bookstores for the books. Adults followed not long after, then adults and teens were reading together. And they didn't stop there. They came back for other vampire stories, werewolf stories, love stories. And they're still returning, enjoying brand new stories, starting brand new series. So what if it's not quality literature. People are reading, and isn't that all that matters? Now for the movie. 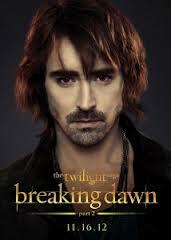 My love for Lee Pace now has no bounds. The baby was ridiculous. Bella was still annoyingly moody. And Jasper still cracked me up (and not on purpose). But DUDE, for a brief moment I got the ending I wanted: pure chaos, blood and death. No, I'm not a morbid individual, but I never understood why you get everyone together for the ultimate battle and no one dies! And one last thing...did anyone else think the ending credits looked like a really long "In Memorium"? So thank you Stephanie Meyer, but so long Twilight. I will be stuck with your legacy (both good and bad) forever. P.S. - Quick note about the bad. We have a patron with the book covers of each of the books tattooed down her arm. Creepy.